We just had an earthquake swarm along the subduction zone trench offshore of the Solomon Islands. Here is the USGS earthquake page for this Mw 6.8 subduction zone earthquake. Here is a map of the region with the recent swarm. This map shows the slab contours (an estimate of the subduction zone plate interface). These contours are estimated by Hayes et al., (2012). This region has been active in the past couple of years. There have been compressional, extensional, and transform earthquakes since 7/7/2013. 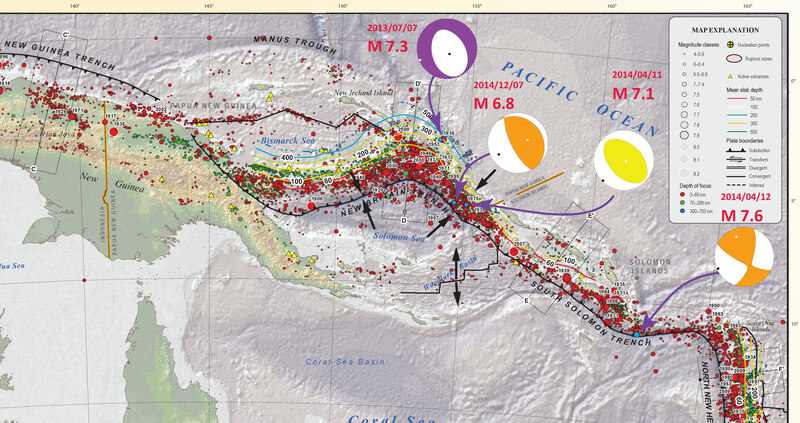 This map shows the earthquake epicenters (blue dots), their moment tensors, magnitudes and date of rupture. Here is my page regarding the earthquakes from April 2014. This is the USGS tectonic poster for the region that I used as a background. I placed black arrows to show the relative plate motion across the tectonic plate boundaries adjacent to these earthquakes. This map shows the general plate boundaries on the region (Tregoning et al., 2000). This map shows the relative age of these oceanic plates of the region (Baldwin et al., 2012). This map shows plate velocities and euler poles for different blocks. Note the counterclockwise motion of the plate that underlies the Solomon Sea (Baldwin et al., 2012). Here is a primer for those who would like to understand focal mechanisms better (from the USGS). Normal earthquakes are extensional, reverse earthquakes are compressional, and strike-slip earthquakes are the result of shear.